We began the day by going to the Temple Mount. First, we had to go through security, making sure that we didn't have any weapons, religious icons or religious books. Ellen warned us that the "modesty police" would be on watch here - as they are in each religious site. Modesty at the Temple Mount entails the usual modest dress, but also no laughing or affection between men and women. Interestingly enough, Ellen informed us, if one's dress is not modest, one can rent a covering (i.e. a scarf) for an hour to drape across the offensive areas. 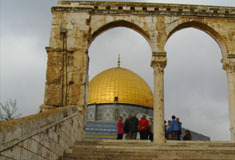 The Temple Mount area is dominated by the Dome of the Rock. This beautiful structure covers the rock and was built in 691 BCE. Non-Muslims can no longer enter the structure (although, 21 years ago, I was able to visit inside), but it is very impressive from the outside. During the Muslim holy month of Ramadan, the courtyards are filled with Muslims. As many as 600,000 people have filled the area. The Temple Mount is sacred to the Jewish people also. Most Orthodox Jews will not come up to this area because the exact location of the Jewish temple is not known. They don't want to risk accidentally standing on where the "Holy of Holies" was located. Instead, they have appropriated the Western Wall as a holy site. Ellen explained how the temple area was laid out during the 2nd Temple era. There was a large area called the "Court of the Gentiles," to which anyone could enter. People would gather groups around them and preach. 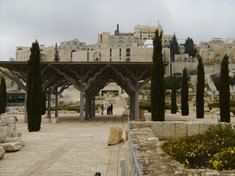 It is suggested that it is in this area that Jesus may have preached. The next area is the Court of Women; then the Court of the Israelites (where men from the all the tribes would gather); the next area is the Court of the Priests and finally the area called the "Holy of Holies." Ellen described how the Temple was constructed of beautiful white rock and had so much gold plate on it that it appeared to be on fire when the sun shone on it. After we left the Temple Mount, we visited the Jerusalem Archeological Park along the southern wall. One of the displays that I liked best was the short movie depicting the Jewish pilgrim coming from far away to make his sacrifice. The movie really helped me to visualize how it all looked - particularly when we visited the exact spots that were depicted in the movie. We saw the remains of many ritual baths and the steps to the Temple gate. The steps were interesting because there was a short step, followed by a wide step. This was constructed so that one had to pause on the wide step to think about God and the purpose for visiting the Temple. We next visited the prayer area of the Western Wall. I personally found this quite meaningful. People from all over the world and from many different faiths were praying to God. There were thousands of tiny pieces of paper stuck into the crevices of the walls, with prayers to God written on them. This part of the wall reminded me that we're all born with a hunger to know God. Our next visit was to the Western Wall tunnel. It was fascinating to see actual stones from the Herodean era as we made our way under ground. The stones are so huge and cut so precisely. Ellen told us that Herod gathered 10,000 of the best stonemasons in the land to work on the temple and in Jerusalem. We came up from underground to jump on the bus and be driven to Caprice - a jewelry manufacturer. They import uncut diamonds from Africa and then process them into beautiful jewelry. Unfortunately, most of their diamond factory was not working when we visited, but we were guided around and saw the equipment. The diamond is actually quite ugly in its natural state - it's amazing that such beauty can come from it. At this location and several other locations during our tour we ran into a large group of Christians from Nigeria. Today was a special day, though. 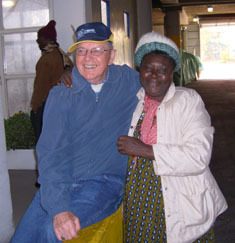 Dr. Schoville is celebrating his 80th birthday tomorrow, and met a lady from Nigeria who has the same birth date. Our next stop was the Israel museum. It's a beautiful museum that you could spend days visiting. Unfortunately most of it is closed for remodeling but we hit two high points. The model of Jerusalem was fascinating - it uses a 1:500 scale. As you walk around it, you get a real understanding of what Jerusalem and its topography was like in the 2nd Temple era, the time of Jesus. We also visited the Shrine of the Book which houses the Dead Sea Scrolls that were found in Qumran, where we visited last week. 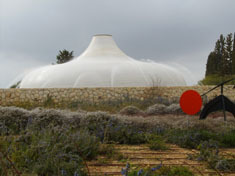 The roof of this section of the museum is shaped like the cover of one of the scroll jars found in Qumran. It was interesting to look at the script and see corrections that were made to the actual manuscript. For example, a tiny word or two would be written above another word - as if the scribe was making an insertion. There was one section that contained 3-4 sentences in extra tiny script - as if the scribe forgot a section and had to squeeze it into the "white space" between sections. Next we visited the Ecole Biblique to connect again with Tom Powers. He took us for a fascinating tour of the 1st Temple period (almost 3000 years ago) tombs located underground. We were able to walk into 6 different tombs. Each tomb was a little room with 2-3 stone "beds" for the bodies. The bodies, wrapped in cloth, were laid to rest on the "beds" with stone pillows. 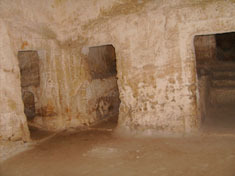 After the body decayed, a family member would sweep out the area and put the bones into a repository located in the tomb. When you peered into the repository, you could still see bones! The final stop of the day was to visit St. George's church and attend the evensong service. After all the hustle and bustle of the past few days in Jerusalem, it was refreshing to sit quietly and listen to God's word. We have visited many churches over the last few days, but very few of them have felt like places of worship. Tonight, I was reminded why we have churches and how good it was to gather with other believers.